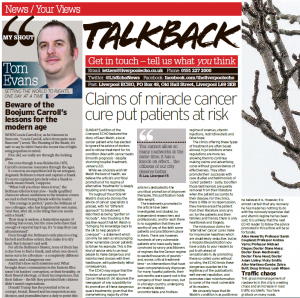 On the 26th January, the Merseyside Skeptics Society sent a letter to the editors of the Liverpool ECHO and Mirror, concerning their uncritical promotion of Gerson treatment and other alternative cancer ‘cures’ in their Saturday 21st January editions. UPDATE: our letter was published in the print edition of the Liverpool ECHO on the 27th January. Saturday’s edition of the Liverpool Echo featured the story of Sean Walsh, a local cancer patient who has elected to ignore the advice of doctors and to refuse treatment for his condition (Man with cancer beats 8 month prognosis – despite shunning hospital treatment, Liverpool Echo, January 21st 2017). While we sincerely wish Mr Walsh the best of health, we believe the article’s uncritical promotion of his regime of alternative ‘treatments’ is deeply troubling and irresponsible. Throughout the article Mr Walsh’s choice to dismiss the advice of cancer specialists is praised, with his “different approach” to treatment described as being “gentler on his body”. Also troubling is the positive report that Mr Walsh is “bringing his knowledge back to the UK to help people in Liverpool” – a statement which can only be seen as encouraging other vulnerable cancer patients to follow his example. This is the kind of advice which can lead people to make dangerous and misinformed choices with their healthcare, with potentially lethal consequences. The Echo may argue that the inclusion of an opinion from Cancer Research UK absolves the newspaper of any culpability for its promotion of these dangerous quack treatments; given that the overwhelming majority of the article is dedicated to the uncritical promotion of disproven therapies, this justification holds little weight. The treatments promoted in the article have been investigated and studied, by independent researchers and professionals, and for each there is no suggestion that they are worthy of any of the faith some patients and practitioners place in them. There are, however, hundreds of very vulnerable patients who have sadly been convinced by savvy practitioners of regimes like the Gerson regime to waste thousands of pounds – and, worse, critical treatment time – on interventions that have been comprehensively disproven. For many hopeful patients, their last months were spent not in the company of their loved ones, but in a foreign country, undergoing an invasive, deeply uncomfortable and fruitless regime of enemas, vitamin injections, restrictive diets and false hope. The clinics offering these types of treatment are often based abroad, in jurisdictions where regulations are more lax, allowing them to continue making claims and advertising cures without good evidence of effectiveness. They often promote their successes with case studies and testimonials of ‘cured’ patients – sadly, too often those testimonials are quietly removed from their literature when the patient succumb to their disease. For the clinics, there is little or no repercussion, they merely erase the patient from their literature and carry on; for the patients and their families and friends, there is only heartbreak and tragedy. The miraculous claims for ‘alternative’ cancer cures make for impressive headlines which are doubtlessly seductive, but as a responsible publication you have a duty to your readers to put truth ahead of sensationalism. By promoting these so-called cures without scrutiny, the Echo lends these dangerous quackeries the legitimacy of the publication’s well-earned reputation, and promotes clear misinformation to some of the most vulnerable of its readers. We sincerely hope that Mr Walsh’s condition is as positive as he believes it is. However, it is almost certain that any recovery he has made has nothing to do with the ruinously-expensive diet and vitamin regime he has been sold; it is unlikely that the next Echo reader to follow the advice promoted in this article will be so fortunate. This entry was posted on January 26, 2017, 14:53 and is filed under Herbal Medicine, Pseudomedicine, Quacks. You can follow any responses to this entry through RSS 2.0. You can skip to the end and leave a response. Pinging is currently not allowed. Superb letter, well written, coherent and logical. Well done MSS. Feel the burn, Liverpool Echo. The article in no way promotes anyone with cancer to deny themselves hoapital treatment it simply reports of a case of positive results from alternative cancer therapy. If the charities and researchers spent more time actually testing these therapies then we would be able to safely say if they work or not. There are countless stories of people using CBD and alkaline only diets whose cancer is cured or considerably reduced. It seems that doctors and health professionals are becoming more narrow minded than people who believe the earth was built in 7 days. Too much money to be made from pharmeceutical treatment to bother trialing these treatments, even alongside existing methods. Do not try and tarnish a rare piece of honest journalism and try to instead explore the possibility that putting poison into your body (which i am not saying isnt effective, as it is in cases of hodgkins lymphoma) isnt always the answer to battling cancer and other seriouse diseases. What would one expect from someone who has been through an education system completely biased to anything other than pharmaceutical gain. If we have numerous local KNOWN people curing themselves in a different way other than NHS pills I think EVEN more should be done to celebrate and media hype these people, if not just To let the general public know there are other options out there. For people in this day and age no matter there background to call it “quack” shows how narrow minded they are and they also “should NOT be allowed to publish there views without a comment from another theory / “quacks” especially when every single one of us has heard a story or know someone who has made a recovery from not taking the NHS advice and searching out something different . The only quacks are the ones to ignorant and arrogant to think there just might be another way. How many of the 13 names above , get funded , salaries or training by the cancer research industry ?????? Hi. He has emailed you guys some questions but apparently you haven’t answered them ? I’ve replied to Sean now – unfortunately I’ve been quite poorly so that delayed my response. Nothing cynical :). I’m not sure how to answer your question because I don’t know what you mean by the “cancer research industry”. I also don’t know how all of the names are funded. Some are from cancer charities such as CRUK and NWCR. Some are from independent research charities like the Wellcome Trust. Some are from independent research councils such as the MRC. Many are funded by a mixture of funding bodies. The funding bodies shouldn’t matter because they do not decide how the science goes. But for the sake of transparency – there are a mixture of funding bodies. None of the researchers who gave their names are signing on behalf of their funding bodies – they are signing on behalf of themselves. Thank you and other researchers at our university for this well written response to this dangerous article. It”s very upsetting to see people so alienated against the people trying to make a difference in the world of medicine. Moreover, it’s shocking how arrogant watching YouTube videos and reading posts on Facebook can make people. Most don’t realise the passion with which researchers work and how they are normal people too. Makes me laugh how these people assume we are part of some wider conspiracy. Then if we, as in anyone studying or working within the medical sciences, tries to tell them they’re misinformed we get accused of working for/being funded by big-Pharma. I don’t know if you saw but a story about a woman who had breast cancer in its early stages and refused surgery and any other conventionally methods in favour of a vegan diet, was recently shared on this young man’s Facebook page. He was praising her choice saying another woman has chosen not to be poisoned, wonder why?.. so he has bare face lied to you in his response saying he offers People “dietary advice”. He does not understand the mechanisms of cancer, but preaches to a large number of followers about it. So dangerous. I’m glad you have chosen to speak up to it. The responses so far clearly show we need to teach critical thinking in schools. Until then, people will think anecdotes trump evidence. Wishful thinking affects how the world works also it appears. Why are people always so angry? Because they have put themselves in a camp and it would be disloyal to think outside it? Kevin Ginger your response is beyond ignorant. Cancer is far too complex to have a single cure and there is no proof cannabis oil works apart from the claims of the people trying to sell the stuff. It appears you are one of the sheeple you describe conforming to the conspiracies of mass media. Maybe go and look at some of the research that has come out of cancer research UK before you come on here to rant that they haven’t got a magic cure. Also have you any idea the amount of money it takes so get one drug on the shelf? Never mind finding one that actually works. Clearly you don’t!